Yesterday, we showed you a few photos of a Xiaomi MI 4 running Windows 10 Technical Preview (as part of an experimental program initiated by Microsoft and Xiaomi). 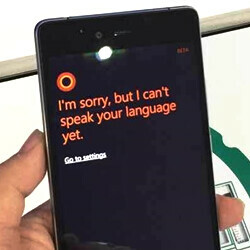 Now, we can see Windows 10 running on another handset that's normally based on Android: the ZTE Nubia Z9. The Windows 10-based Nubia Z9 was spotted in China, at the event where Microsoft announced that the new version of its OS would be released in 190 countries and 111 languages starting this summer. While Xiaomi said that it won't really manufacture Windows 10 handsets, it's not clear what ZTE's plans regarding Microsoft's new Windows are. In any case, the regular Nubia Z9 will certainly run Android at launch (Android 5.0 Lollipop, to be exact). ZTE will likely release the Nubia Z9 as a successor to last year's Nubia Z7. The new handset seems to be powered by Qualcomm's octa-core Snapdragon 810 processor, and it could sport a Quad HD display of around 5.2 inches. We'll bring more about the Nubia Z9 once ZTE announces it. From Xiaomi to ZTE...this is something new. This is actually a good thing. Microsoft is after all a software company like Google. It doesnt matter to them if windows is running on a Xaomi device or ZTE or its own Nokia/Microsoft. As long as people are using the OS, they are happy. So a custom ROM is a clever way to achieve that. No one would mind having that option and people can root and put w10 when they are bored with android and back when they are bored with wp! I say this move will benifit them big way! Vote on Windows Uservoice, I have created a post, Remove activation and embrace torrent, I can't paste my links here right now. Is China ready for Microsoft WP phone with their government actively cramming down US softwares tech influence. If i am Chinese national i will just go with a Chinese mobile OS. Yahoo is smart to withdraw resources away from the resource draining black hole. Well, I think it'll be at least a good temporary solution before they develop their own platform. They've had gripes with Google for years over censorship laws. All the Android phones in China has no Google services to give their own start up a chance to strive. And strive they do, XiaoMi own store has a strong presence there. ZTE also have their own app store. Microsoft dumping money into China is indeed a temporary solution. They are off investing on new tech and feature or at least choose market that are open to US influence.